Did you ever wonder who were the original Gerber baby, Aunt Jemima, and Betty Crocker, and the reasons why their images evolved over the years? Neatorama has a post (part of a running series about logos) about the stories behind the famous images that appear on our food labels. 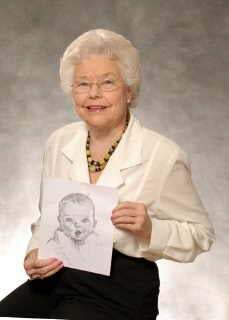 Above is a picture of Ann Turner Cook, who modeled for the Gerber brand. Born in 1926, she's now a retired teacher who writes mystery books. You can check out her website here. Here's how she's changed over the years. Aunt Jemima pancake mix was developed by two men in 1889. They chose the name after hearing a song called "Old Aunt Jemima" performed by a black-face vaudeville singer who donned an apron and bandanna. The business was sold a year later to R.T. Turner who hired Nancy Green, a former slave, to bring her to life for the brand. Here are the six women who have portrayed over the years. To read more about the stories behind other food logos like the Jolly Green Giant, Quaker Oats, and Sara Lee, click here.